A play by Tennessee Williams, performed at the Olivier, National Theatre, London: 29 March (previews began 19 March) - 8 August 2007. With thanks to Nadine for these photos. In a small Sicilian-American village, near New Orleans, spirited seamstress Serafina delle Rose awaits the return of her truck-driver husband, Rosario. He has pledged to end his participation in the illegal smuggling into which he was coerced by his employers, making the prospect of the couple's reunion particularly happy. Yet the hours pass and Serafina is not reunited with her husband. Instead she learns that he has been murdered, perhaps by his criminal connections. Her life in tatters, the widow sinks into a deep depression for three long years. When her fifteen-year-old daughter, Rosa, catches the eye of sailor Jack Huntley, Serafina reacts badly; it seems that she no longer believes that any good may arise from love. Initially fearing for Rosa's honour, the widow forbids her daughter to leave the family's ramshackle house. Her misery is then intensified when she learns of Rosario's infidelities. Shocked by these discoveries and at her lowest ebb, Serafina finds herself being charmed by another truck-driver, the rather clownish Alvaro Mangiacavallo. Having spent years locked in despair, slowly she is reinvigorated. Stephen Pimlott, the original director of this production, sadly died shortly after rehearsals began. His good friend Nicholas Hytner then assumed the role of director. Despite the difficult circumstances, the cast and crew put a great deal of energy into bringing The Rose Tattoo to the stage and thereby honouring their colleague's memory. 'Like Steven’s own life, we have to celebrate it', Zoë commented about the play at the time (see 'This Will Be a Celebration of Life' interview). The production gave Zoe her third opportunity to perform in a Tennessee Williams play, following her success in A Streetcar Named Desire (1975) and The Glass Menagerie (1995). She is drawn to Williams's plays, she says, because the playwright created fantastic, complex roles for women (see 'Wild About Williams'; Zoë's comments appear about half-way through the article). The Rose Tattoo was part of the National Theatre's fifth Travelex £10 Season, in which the majority of tickets were reduced in price. The initiative aimed to encourage both first-time and occasional theatregoers to watch a performance, as well as making theatre more accessible to those on low incomes. Zoe's previous production at the theatre, His Girl Friday, was part of the first, similarly successful £10 ticket season. Larissa Tasker, who played one of the village children, clearly enjoyed working on the play. 'The rehearsals are going really well and Zoe Wanamaker's really nice', she said shortly before The Rose Tattoo opened (see 'Larissa Lands Role on London Stage' interview). In addition to The Rose Tattoo, Zoe's productions with the National Theatre Company include The Importance of Being Earnest (1982), The Bay at Nice and Wrecked Eggs (1986), Mrs Klein (1988), The Crucible (1990), His Girl Friday (2003), and Much Ado About Nothing (2007). Zoë's father, Sam Wanamaker, directed and appeared in the first production of The Rose Tattoo in the UK. He played Alvaro, opposite Lea Padovani's Serafina, in the show, which opened in 1958. The Rose Tattoo is 'a creation of ripe, shameless, full-blown beauty', enthused The Times's Sam Marlowe. He reserved special praise for the central performance, emphasising that 'Zoë Wanamaker’s Serafina is an irresistible creature of sensuality'. Paul Taylor, writing for the Independent was also impressed by Zoe: 'she brings compelling intensity, pain and (in the second half) some delectably timed comedy to the role'. 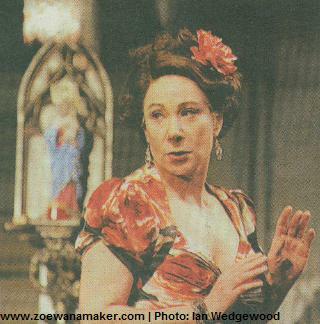 As Philip Fisher of the British Theatre Guide concluded, 'Zoe Wanamaker makes an entrancing heroine'. With a 'spectacularly fine' portrayal of Serafina, concluded Michael Billington in the Guardian, Zoe gave 'the performance of her career'.